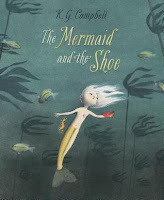 The Mermaid and the Shoe is a dreamy book about a mermaid named Minnow who doesn't know what her purpose is. She feels useless until one day she finds a strange object that sets her off on an adventure to discover what it is. In that search, she finally learns her purpose. I loved seeing the world from the perspective of Minnow, particularly the way she conceptualizes things on land that don't make sense to her. For example, a lighthouse is referred to as a huge shell with a door and a child as a 'landmaid.' Author K.G. Campbell has fun with language in this story; I hope "eyes the size of sand dollars" is a phrase that catches on around my Bahamian school! It's hard to be a goat when there's a unicorn in town. What good are your marshmallow squares when the unicorn can make it rain cupcakes? Goat spends much of the book seething with jealousy until Unicorn starts to appreciate Goat's special gifts. A fun message without preaching to readers. I love the illustrations in this book and how fun and silly everything is. I've never read a Bob Shea book before, but need to seek out more. This is a book I'll be buying for my niece when she's in kindergarten. I love the message in Chopsticks. Nobody's ever seen them apart, but when one chopstick is injured, the other has to stand on his own and learn who he is without his mate. Rather than dividing them, it gives them more to share with each other when they are reunited. 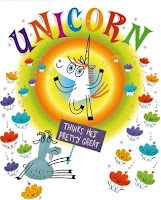 Amy Krouse Rosenthal has written a funny book that young readers will love taking apart. There is silly wordplay (the whisk "whisks away") and fun illustrations. 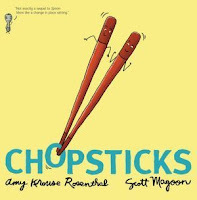 I love all the things that a chopstick could do; my favorite was testing a cake to see if it was done. This would be a great read aloud or bedtime story. A brilliant idea that I'm surprised no one has had before. 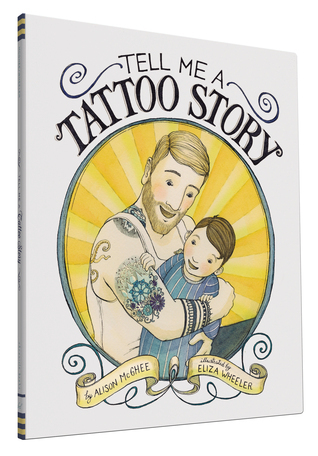 Tell Me a Tattoo Story is about a little boy whose routine is to ask his father to tell him about each of his tattoos. Fortunately, they are all heartfelt and appropriate! They detail a book he read as a child, his longest trip, meeting his wife, and the most special of all--the birth of his son. I can imagine any parent with a tattoo wanting to buy this book for their child. It's nice that the father was in the military, but the story doesn't dwell on it. I hope Alison McGhee sells a ton of copies, based on this clever idea.